It's the final night of the Surreal & Trippy block of movies, and the next to last night of Bride of Project Horror! 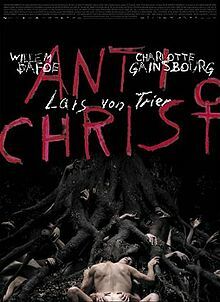 I've only seen a few of Lars von Trier's films, but they always stay with me for a long time afterwards. He's often accused of misogyny in his work, and although I can understand that argument, I don't agree with it. Of the movies of his I've seen (this, Breaking the Waves, Dogville, Dancer in the Dark), they all revolve around women who are either degraded, abused, humiliated, or suffering a slow slide into a worse state. Of course, I can't see inside von Trier's mind, but I don't think his intention is to sanction this treatment of women, as much as it is to examine people's behaviors towards each other. The main character in each of these movies is a person in a position of extreme vulnerability first, a woman second. Antichrist is a hard film to get a handle on, and an even harder one to summarize succinctly. This is the kind of movie people write dissertations on. It's about a couple (never named) whose young son dies in the first scene of the movie. Although the death is accidental, it's hinted that the wife knew about, and could possibly have prevented, the circumstances which lead to their son's death. To help deal with her grief, her husband (a psychotherapist) takes her to a cabin where their family used to travel together, and where she had gone the summer before with their son, in order to work on a thesis. She has identified this place as the origin of her fears, and he believes that she can be helped by forcing her to face those fears. Once they reach the cabin, things get worse and worse, as it seems even nature is turning on them. He begins having visions of animals in extreme circumstances, almost like they are warning him. Then he finds some of her writing from the previous summer, and realizes that she has been dealing with mental demons for far longer than he had thought. When he finds evidence that she may also have been hurting their son, things become much worse, and far more gruesome. There are some really severe scenes in this movie, both of sexual violence and other graphic trauma, but that's not what's going to haunt me. Watching the gradual deterioration of both the wife's mental state in this movie, and of their relationship (to say nothing of the very enigmatic and creepy final scene) is the stuff that nightmares are made of. Like some of the other movies I've watched, I definitely would not recommend this one to just anybody. It's got some scenes of a very frankly sexual nature, and it raises some very uncomfortable questions about relationships, gender, and violence. But I can say that, like von Trier's other movies, it's one that's going to stay with me for a while. I give Antichrist five grindstones out of five. Tomorrow night: I don't actually know for sure yet what the final movie will be! Stick with me to find out!